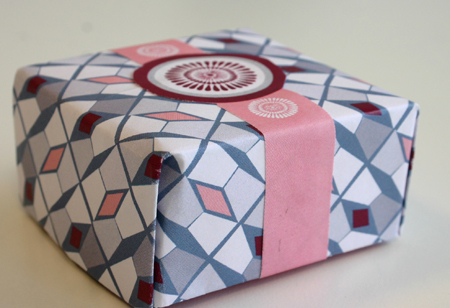 Elegant Small Gift/Favor Box: Pink, Grey and Burgundy Motif. | Print, Cut, Paste, Craft! Elegant Small Gift/Favor Box: Pink, Grey and Burgundy Motif. Yes, another Origami Box! I love them…This one has a grey/pink/burgundy motif and you can choose between two different kinds of printable ribbons. It’s such a classic motif, it would be a great idea for favors for a bridal shower or even a little girl baby shower. To read the instructions on how to make an origami box go to our “How to” section by clicking here. Click Here to download the PDF file, containing the printable template for the box and the ribbons.